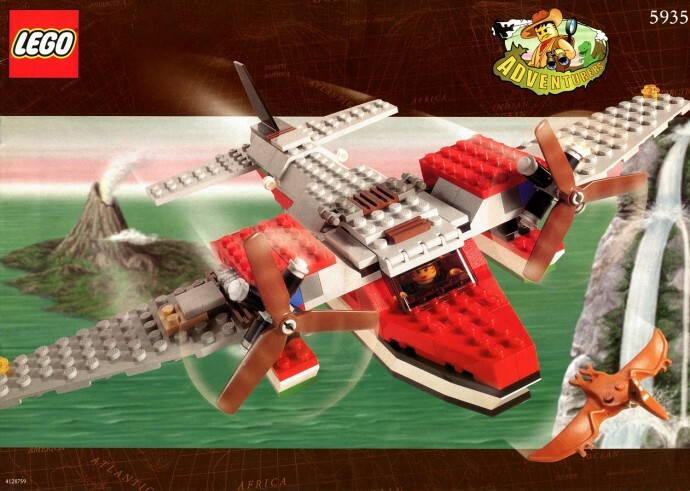 Today's random set is 5935 Island Hopper, released in 2000. It's one of 17 Adventurers sets produced that year. It contains 205 pieces and 1 minifig, and its retail price was US$20. It's owned by 2247 Brickset members. If you want to add it to your collection you might find it for sale at BrickLink or eBay. I still have this set built. The only issue with this awesome set is that the engines fall off too easily when playing with it. It looks like the Cutters Goose from Tails of the gold Monkey! Each subtheme of the Adventurers line had a really cool old-school plane, right? The Egyptian bi-wing, the pontoon plane from the Amazon, even the Thunder Blazer that Johnny used to fly over the Himalayas. But this was easily the best plane of them all. My one criticism is there's not much internal space -- you get the pilot, and some goods storage at the back, and that's it -- but it's such a gorgeous plane. And the best thing about most of the Adventurers vehicles is they look great in a town setting as just vintage styles of transport. This was my first "big" Lego set, where as a kid I defined "big" as anything over 200 pieces. It may be blocky compared to its modern counterpart, the 2017 Creator set Island Adventures, but otherwise it's aged very well. My only real criticism is that the standard tail fin part is drastically undersized for an airplane this large. Woah, the pterodactyl in the corner is easy to miss. I’d be for gettin’ away from that island. great size but too many studs. Best plane set. I wish they’d have made a non-float plane version. I like the first series of the Adventurers. Later sets lost some of the creative spark I think. I have this one. I had a few of the Adventurers sets when I was getting back into Lego. I had a cull of sets a few years back and those sets went - except this one. I decided to keep it. It is a bit too grey for my liking these days (I prefer pretty colours now) but I do love it. I have this one as well. Quite an advanced set for its time looking back. The building techniques were more akin to the Creator 3-in-1 sets of today than say the Town plane sets that proliferated during the 90s. And this was the Adventurers line where Harry Cane vanished without a trace, never to be seen again, leaving Pippin Reed to take over as pilot for the group. A skill she'd never displayed before, but I guess must have adapted to it pretty quickly? Still has the classic, mostly studded and angled look. I don't think everything needs to be covered with tiles or rounded parts to be a nice LEGO set. This is one of my favorite sets of all time! Ditto to all the praise above! I love how the ad recreates the box art almost exactly, and "Thunder Adventure Tours" with the original set number being used in the phone number is just too much. Clearly the (graphic) designers of that set loved this set as much as we all do, which is heartwarming to know. This set is great, have very fond memories of playing with it. still have it today!